the evil that happened there. KKK. In them Guston’s eschews Goya’s high drama staging for something more pedestrian. He said, “The idea of evil fascinated me. I almost tried to imagine living with the Klan. What would it like to be evil. To plan, to plot.” His paintings picture Klansmen smoking or going for a drive, just being normal- while cloaked in their trademark white hoods. In this series, sourced from the sites of two important conventions held around Berlin in the 1940s – the Wannsee House and the Little White House, Moro documents innocuous aspects of the interiors and the local landscape- a painting on the wall, a tin ceiling pattern, the bucolic landscape seen from the window. The Wannsee House was the site of the Wannsee Conference, where the senior officials of Nazi Germany convened to decide the direction of the Final Solution in 1942. There is one remaining transcript documenting the Nazi’s logistical arrangements around how and when ‘deal’ with the Jewish population. Unless you know the backstory, Moro’s image of the house in “X photo” is deadpan, a straightforward portrait of a suburban residence. The second site, the Little White House, housed then-newly nominated president Truman, Stalin and Churchill during the summer of 1945. It was at this site that Truman first heard the Manhattan Project was a success. While there is no evidence that these talks led to the decision to drop two bombs on Japan, they were dropped 4 and 6 days after Truman returned home to America. frustration, as they reveal nothing. 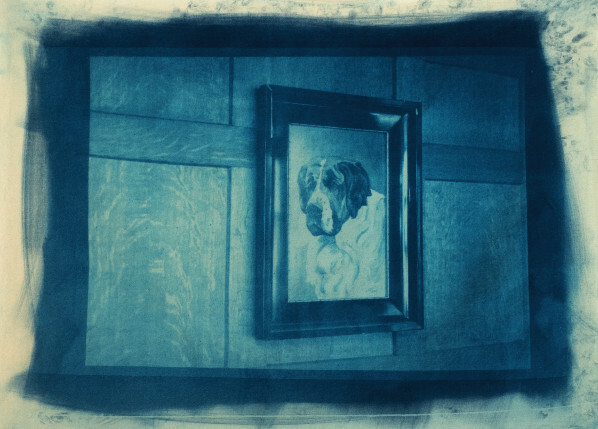 Only the deep blue of the cyanotypes signify that something is amiss.